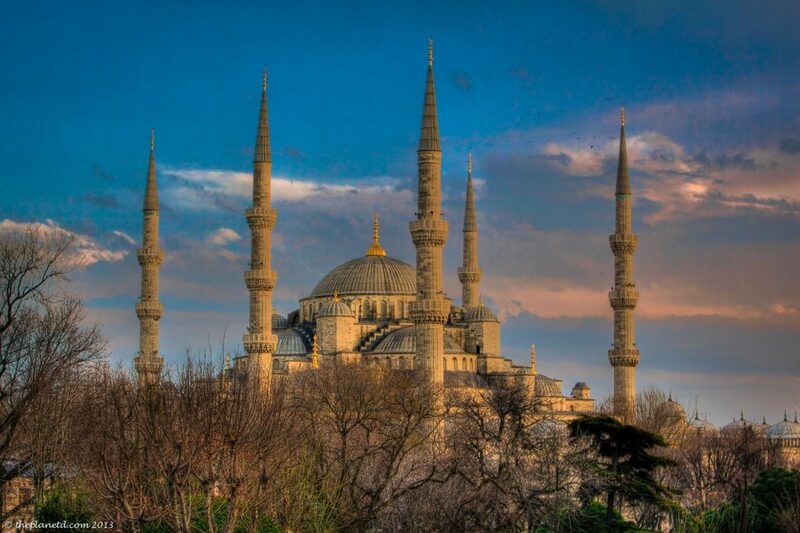 The Sultan Ahmed Mosque of Istanbul is the city's most famous landmark. 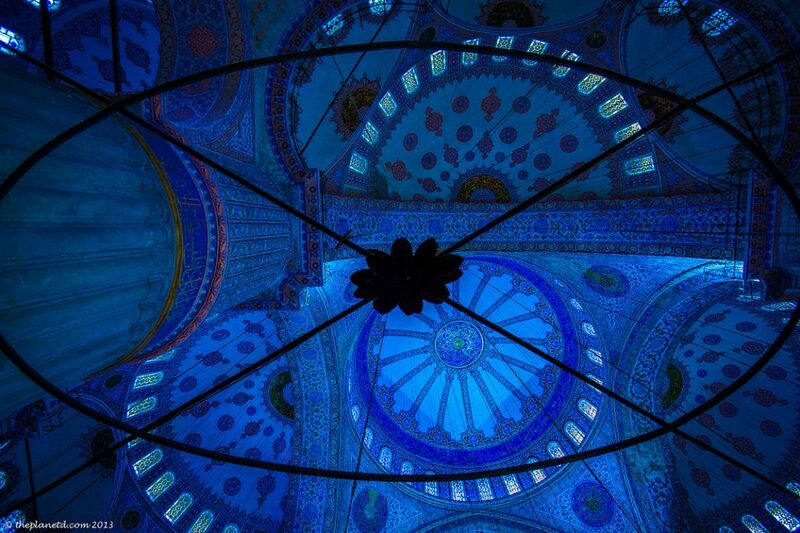 You may not have heard of the Sultan Ahmed Mosque, but I am sure that you have heard of the Blue Mosque. So why is it called the blue mosque when it is clearly not blue? It got it's name from the interior tiles of the building. When you go inside to see it you'll then understand. However, it is the Blue Mosque's exterior that stands proudly over the old city of Istanbul. You can see it from nearly every vantage point and we shot this photo from the transit stop on the main street. A stroll along this street will take you to many of Istanbul's top sights including, Hagia Sophia and the Grand Baazar. Make sure to check out our 12 Things to do in Istanbul for more highlights! We were actually on our way to a family dinner and weren't planning on shooting the Blue Mosque at this time, but as we looked up from a small park near the street the sun was the perfect light. It ignited the building's dome and six minarets. Dave whipped his camera and quickly changed lenses to his 70-200 zoom lens as I rushed to set up the tripod. You never know if you will get a shot like this again or if the weather will co-operate again, so when you see light like this, you must seize the moment. This was when Dave said to me “this is the prime reason you need to know your camera” He knew exactly what settings to put it on without having to do any test shots. He took the photo and within a few minutes, we were on our way to dinner without missing a beat. It was built with six minarets instead of the usual four and caused a bit of an uproar. The Sultan originally wanted a minaret made of gold but the architect misunderstood gold to be six. You see, the Turkish word for gold is “altin” but the architect heard it as “alti” which is Turkish for six. This mistake made it one of the grandest mosques in the world. The Sultan ended up loving the mistake as no other sultan on earth had six minarets. Today the Blue Mosque is a popular tourist attraction of Istanbul. Even though it is a mosque used as worship, visitors can enter through a separate foreigners entrance to explore the interior. You must wear long pants/skirts and covered shoulders. Avoid Flash Photography, speak quietly and be respectful of people praying. Listen for the call over the loudspeaker and if there is singing through the city, you'll know not to go to the mosque at this time. 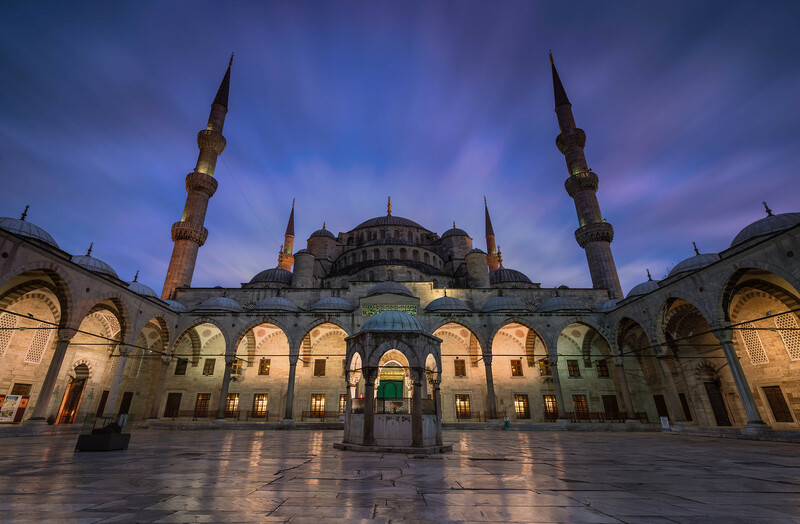 12 Responses to "The Blue Mosque of Istanbul and tips for Entry"
There are numerous places to visit in Istanbul, I have been to the city last year with my family. It was a 6-day trip and a lifetime memorable experience. We covered all the landmark sights, Hagia Sophia, Blue Mosque, Topkapi Palace, Basilica Cistern, Suleymaniye Mosque, Bosphorus Strait and many more. Amazing shot! What kind of camera did you used for this? Thank you, we use a A Canon 5D Mark II Cheers. Looks quite a sight! Thats a wonderful capture. A beautiful shot! Will need to check this out when I go! Thanks!